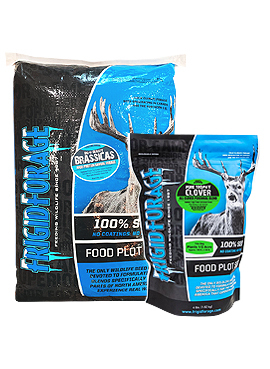 Frigid Forage Pure Trophy Clover is exactly what the name implies, 100% clover. Pure Trophy Clover is an equal blend of 5 different clovers that will provide a high protein food source for deer and other wildlife from early Spring all the way to hunting season. The advantage of planting blends is they are more versatile and will thrive in a wider range of conditions making them an ideal choice for most any situation from open fields all the way to shaded areas and woodland trails. Pure Trophy Clover is a great choice for rotational planting with annual blends such as Big n Beasty and also a great choice for frost seeding. Clover adds nitrogen to the soil that is heavily used by many annuals and Frost Seeding is an effective method for strengthening an existing food plot or planting new plots that are difficult to access. It can also be planted with little or no tilling of the soil as long as the existing vegetation is eliminated. Seeding rate is 8-10 lbs/acre. Contains 20% each of: Ladino Clover, Mammoth Red Clover, Medium Red Clover, White Dutch Clover, and Alsike Clover.